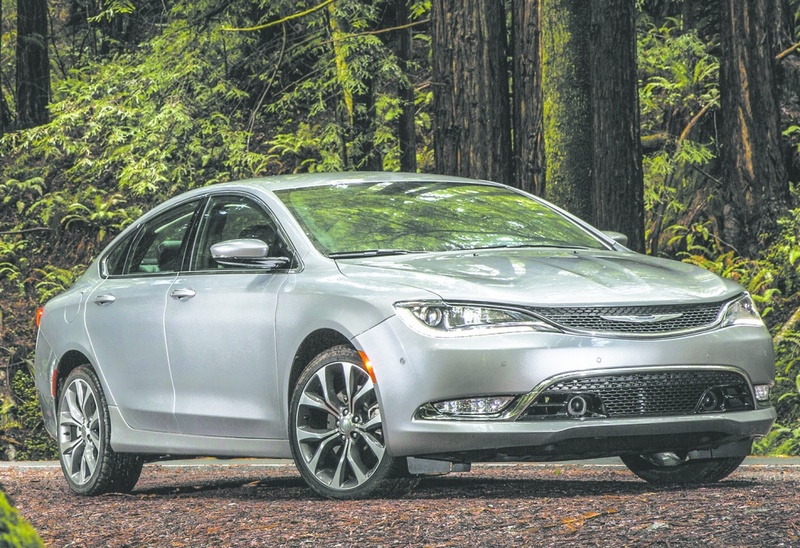 Chrysler’s five-passenger midsize sedan, the 200, received a complete redesign for 2015, and gets just a few tweaks for 2016, some model-specific. 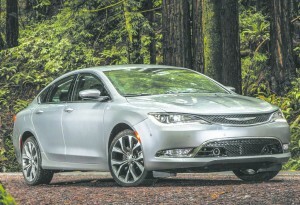 Four models are available: LX, Limited, S and C, priced from $21,995 to $26,625 before add-ons. 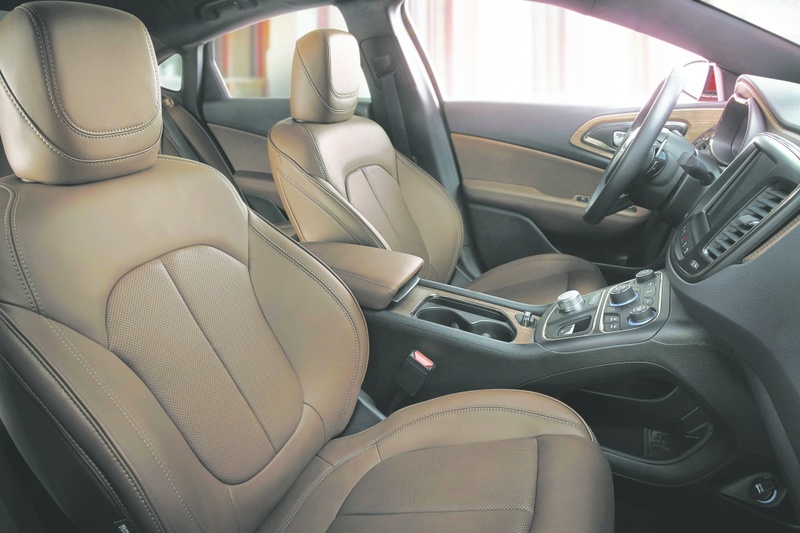 The tweaks and additions include firmer front seats; an optional rearview camera for the Limited; and an exclusive 90th Anniversary Edition for the Limited model, which includes the Convenience Group. With the Anniversary Edition ($1,995 extra) comes with UConnect 8.4 with accessory switch bank, integrated voice command with Bluetooth, navigation capability, auto-dimming rearview mirror with microphone, SiriusXM, special splash screen Anniversary logo on the 8.4-inch touchscreen, floor mats with the Anniversary logo, Anniversary badging, and a power express-open/close sunroof. 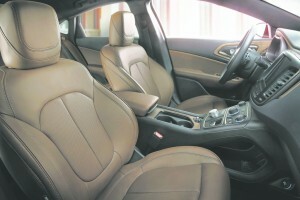 The heated steering wheel and heated seats warmed automatically when the temperature was below freezing – very nice. 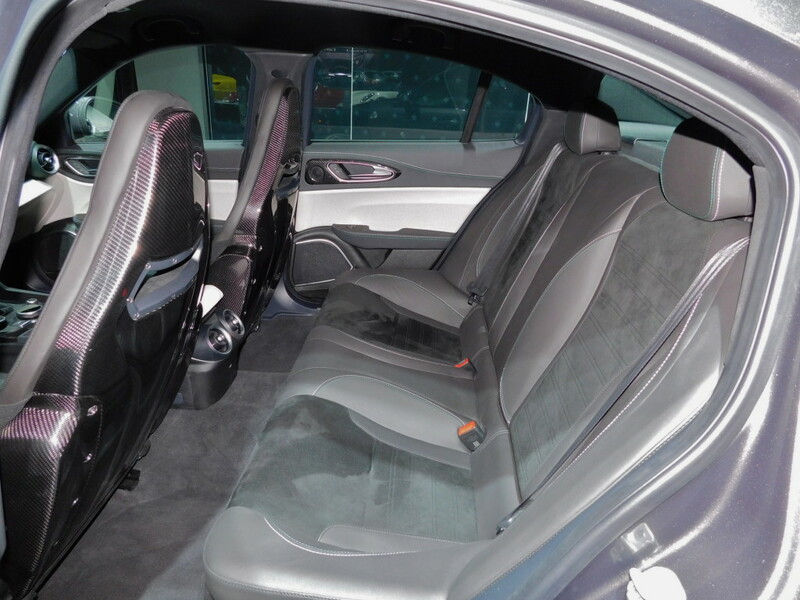 My 200C was classy and elegant, inside and out; the steering wheel, center stack and console controls were handy and intuitive; the passengers were comfortable and safe (thanks to lots of air bags and safety technology, including a 911 button on the rear view mirror); and handling was smooth if not energetic, although the ride was somewhat firm at times. 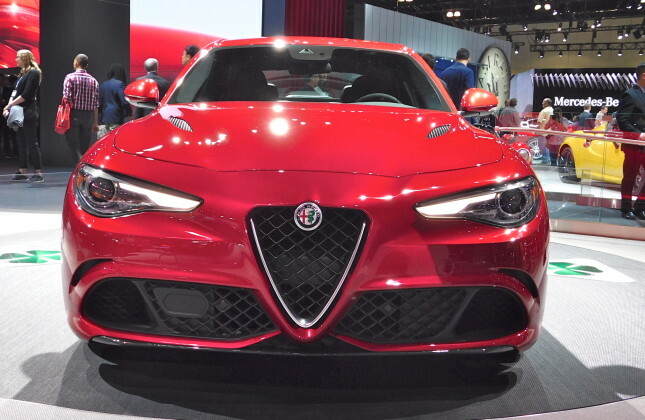 In a spectacle to warm the hearts of performance enthusiasts and style aficionados alike, Alfa Romeo kicked things off at the 2015 Los Angeles Auto Show by bringing in a whole tent full of vintage Alfa Romeos, amidst which the company launched its new premium mid-size sedan, the Giulia. The emotion isn’t just skin deep, Alfa Romeo promises. 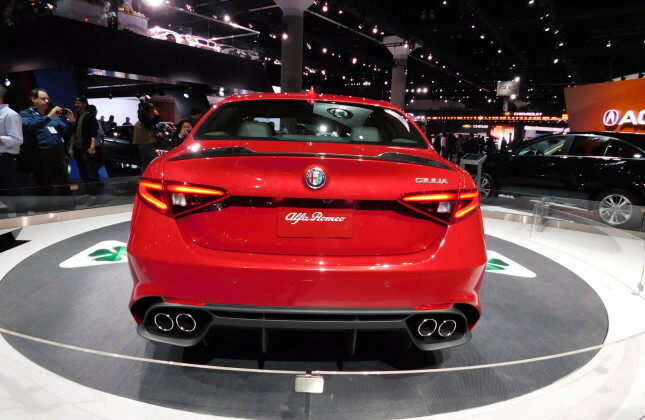 True to its Italian roots, the new sedan embodies classic Alfa Romeo style, from its shield grille centred in the signature V-shaped “Trilobo” front fascia, to the short overhangs, muscular fender arches, long hood, and short rear deck lid. It’s a look that Alfa Romeo says reflects “la meccanica delle emozioni” – the mechanics of emotion – and in person it’s quite stunning. The emotion isn’t just skin deep, Alfa Romeo promises. The company brought aboard a pair of Ferrari engineers to help lead development of the Giulia, and the new sedan is claimed to have a near perfect 50/50 front/rear weight distribution, segment-leading torsional rigidity, a low centre of gravity, and what Alfa Romeo says is the most direct steering available thanks to its double-wishbone front suspension with semi-virtual steering axis, combined with the Giulia’s rear-drive architecture and extensive use of lightweight materials. 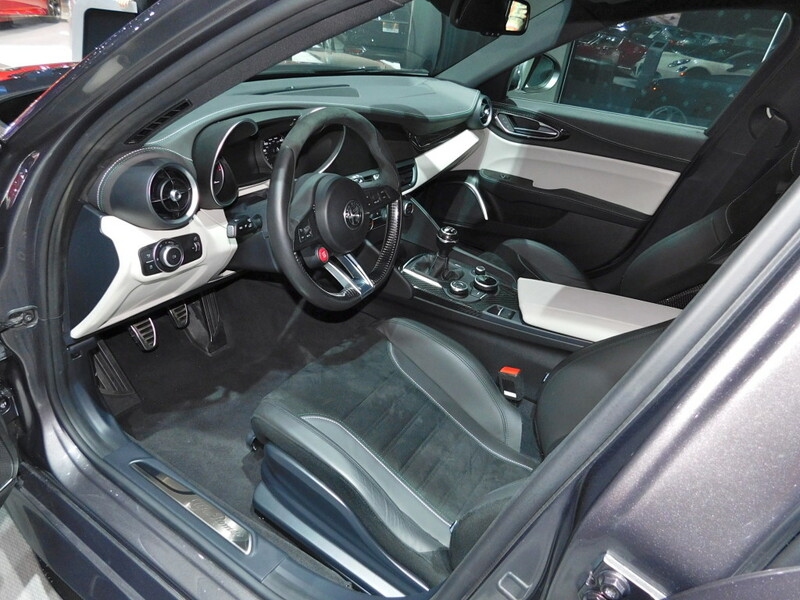 Inside, unique touches include a fully-integrated 8.8-inch infotainment screen, Formula 1 inspired steering wheel, authentic carbon fibre trim, and available Sparco racing seats. Control for the infotainment system is through an all-new Alfa Rotary Pad interface with gesture recognition, allowing the driver to interact with the system by simply moving fingers on the pad. 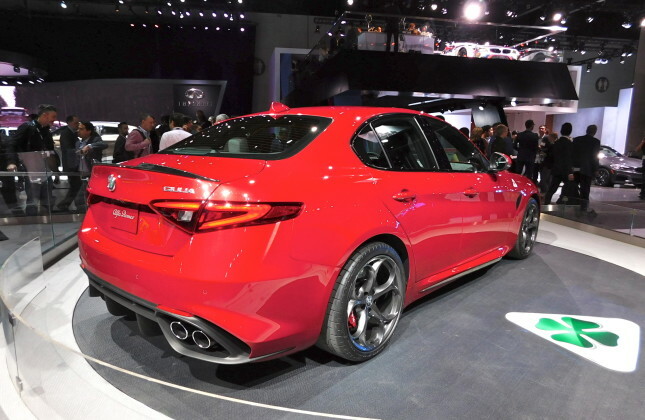 When the Giulia hits showrooms it will start at about US$40,000 for the base model, which will be powered by a 276-hp all-aluminum four-cylinder twin-scroll turbo engine with direct injection and MultiAir2 technology. 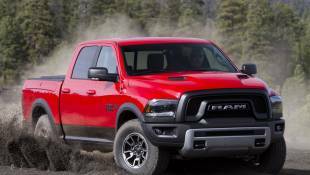 Rear-wheel drive or all-wheel drive will both be available we’re told, as will a six-speed manual transmission or an automatic with paddle-shifters. At the Los Angeles Auto Show, however, there wasn’t a single base model in sight. 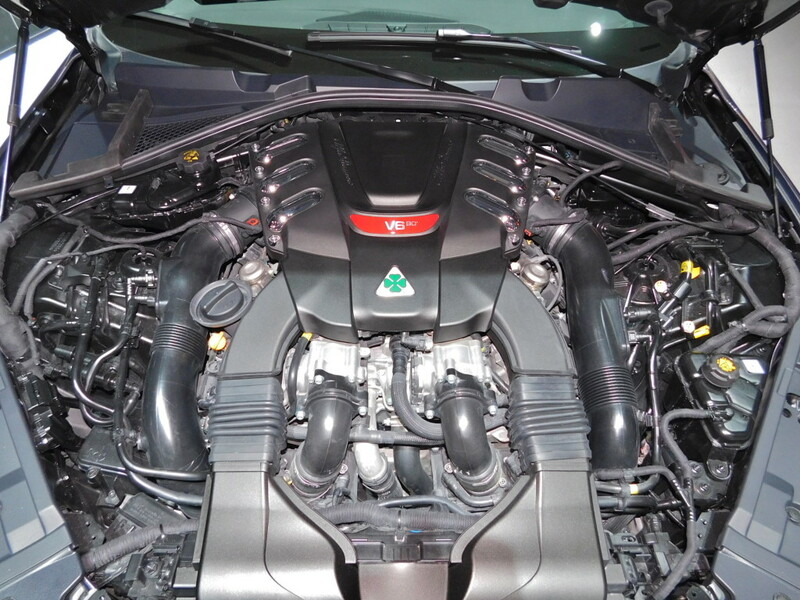 Instead, Alfa Romeo was shining its spotlight on the performance-oriented Giulia Quadrifoglio edition, which appears to be aimed straight at the heart of the BMW M3 buyer. Starting at about US$70,000, the Giulia Quadrifoglio edition will be powered by a Ferrari-derived 2.9L biturbo V6 that churns outs 505hp and 443 lb-ft of torque, delivered to the rear wheels via a six-speed Getrag manual gearbox (Bigland hinted that an automatic with paddle-shifters would also likely be available for the Quadrifoglio). 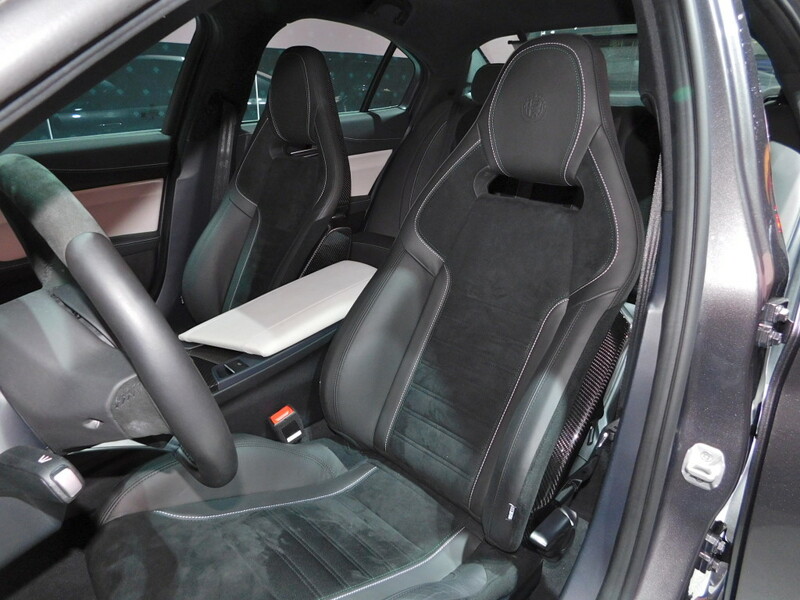 Extensive used of lightweight materials including a carbon-fibre hood and drive shaft, and aluminum subframes, front shock towers, suspension components, doors and fenders will keep the weight down, allowing an impressive (and what Alfa Romeo says is best-in-class) power-to-weight ratio of 3.18 kg per horsepower. 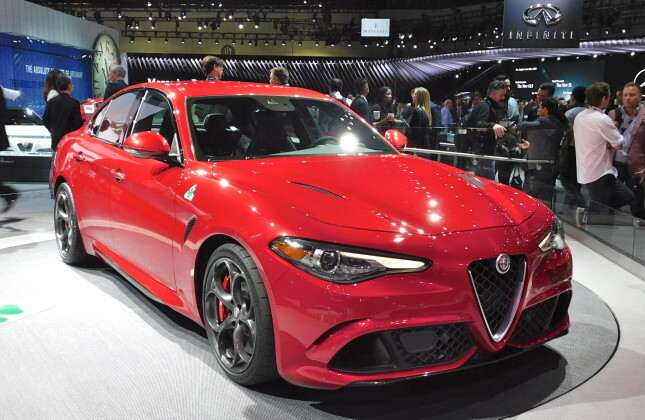 Technologies aimed at amplifying the driving experience aboard the Giulia Quadrofoglio include an active aero front splitter to actively manage downforce and help achieve best-in-class aerodynamics, an electromechanical integrated braking system that replaces the tradition electronic stability control unit and brake booster for more instantaneous braking performance, torque vectoring with twin-clutch rear differential, and a Chassis Domain Control system that coordinates all of the vehicle’s active systems including the stability control, torque vectoring, adaptive damping suspension and active front splitter. Combined with big carbon ceramic brakes and staggered 19-inch wheels (patterned on a traditional Alfa Romeo design) these technologies enabled the Giulia Quadrifoglio to post the fastest-ever lap time for a production four-door car around the famed Nürburgring, coming in at 7 minutes and 39 seconds, a full 13 seconds ahead of its nearest rival. 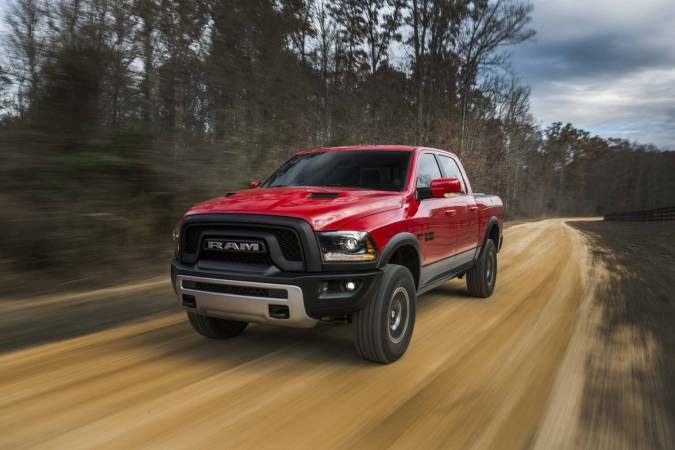 Top speed is claimed to be 305 km/h, and 0-100 km/h should take about 4 seconds. 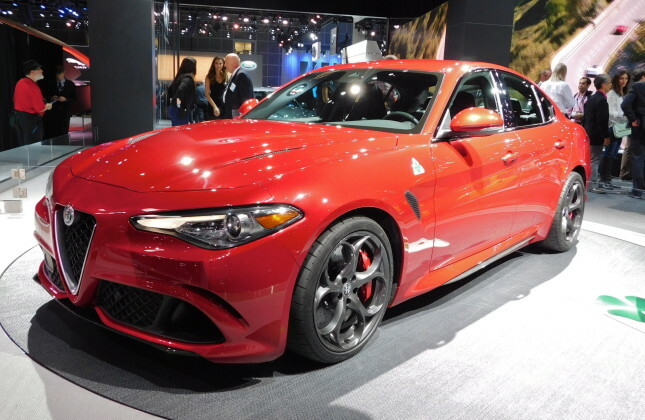 With a more complete line-up of cars now including a sedan, it appears that Alfa Romeo is determined to lead its own Italian Renaissance here in North America. 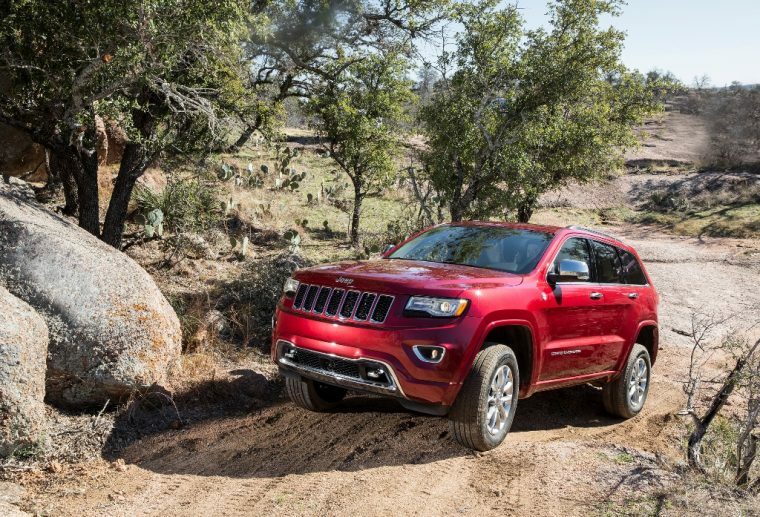 And while for now the company will continue to sell its cars through the same network of 82 US and four Canadian dealers that were announced in June 2014, it’s expected that the dealer network will expand to include 300 or more North American franchises once the brand becomes more established. Canadian dealerships are currently in Vancouver, BC; Vaughn, Ontario; LaSalle, Quebec; and Boischatel, Quebec.